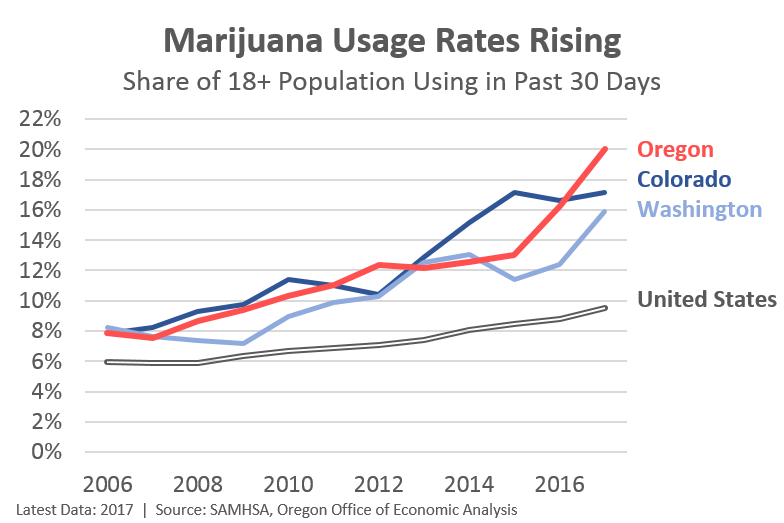 Yesterday we took a quick look at industry growth and volatility in Oregon. Two sectors really stood out for their strong gains and stability: education and health. Both have risen twice as fast or more than total employment in Oregon in recent decades. However there is a clear reason for these gains: demographics. When you adjust education and health employment for population the exceptional growth doesn’t look so exceptional. In fact it looks downright mundane. A growing population with an increasing share of retirees, and rising rates of educational attainment means we need more workers serving these groups. Now, one tangent I find interesting/perplexing/depressing is when communities, usually smaller and/or rural, do market analyses about growth opportunities, the consultants always come back with the same answer. That is they should try and turn themselves into a hub for tourism, health care, or education. This is somewhat of a circular reference, however. The sectors that are growing pretty much everywhere are health care (people age in every county) and leisure and hospitality (people go out to eat and travel). However this largely reflects sectoral shifts. Right now the macroeconomic outlook is largely stable. The economy is slowing and is expected to continue to slow over the next year or two. As Tim Duy recently noted, this means we are likely to see more “bad data” or data that surprises to the downside given the overall slowing trend. If we didn’t then the economy wouldn’t be slowing! Case in point being the latest retail sales report from December. While there is some growing concern about the macro outlook, the baseline remains for expansion and not for recession. 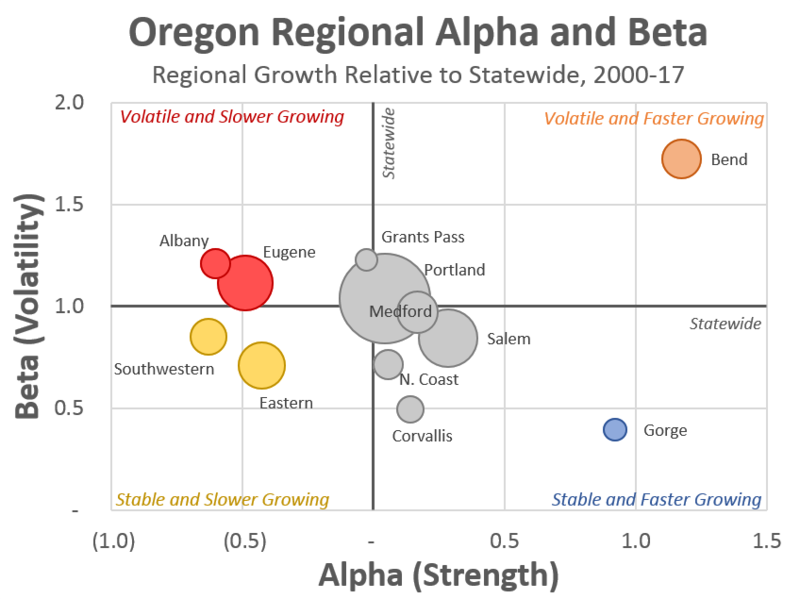 This also gives me a chance to dust off some work we’ve done in the past year looking at Oregon’s volatility across industries and regions. Overall, Oregon’s underlying economy is more volatile than the U.S. for two primary reasons: industrial structure and migration flows. Today we’re focusing just on the first part. What we’ve done is borrow some concepts from the financial literature. Alpha refers to whether or not an asset grows faster or slower than the overall market over a long period of time. In this case we’re looking at which industries are growing faster than overall employment over the past two decades. Beta refers to whether or not an asset fluctuates more than the overall market. In the chart below we are looking at whether an industry grows quicker in expansion and falls further in recession than overall employment. A few things stand out in the chart above. First, many industries move in sync with the overall business cycle and to roughly the same degree. 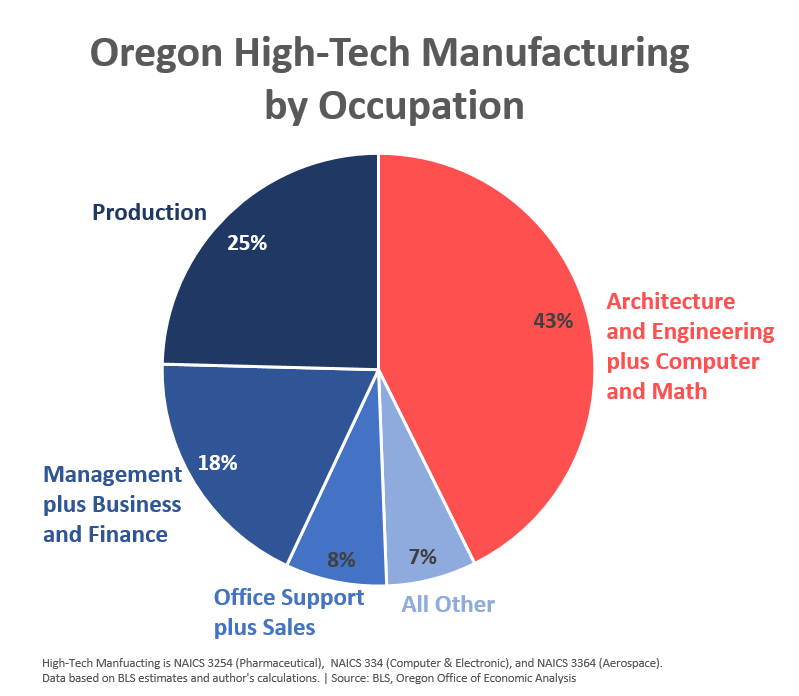 Second, what makes Oregon’s industrial structure different is our larger concentration in the goods producing industries (natural resources, construction, manufacturing). These are more volatile over the business cycle and is what helps drives Oregon’s overall volatility. This is not necessarily bad. Just as we talk about with state revenues, there is a trade off between risk and return. 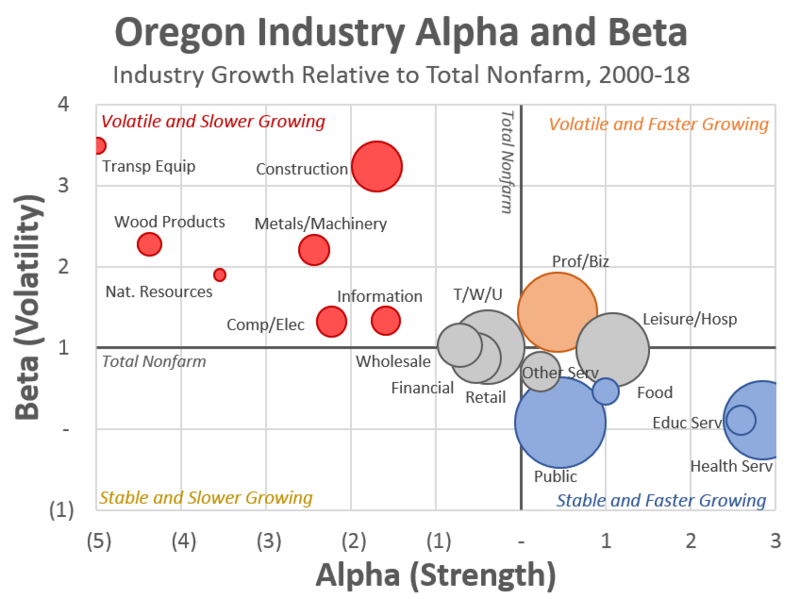 When it comes to subsectors like construction, computer and electronic products, food, metals and machinery, Oregon has outperformed the US. We are gaining market share even as they are more boom and bust over the business cycle. On the other hand, subsectors like wood products and transportation equipment we are not gaining market share. Being red in the chart above is not a bad thing. 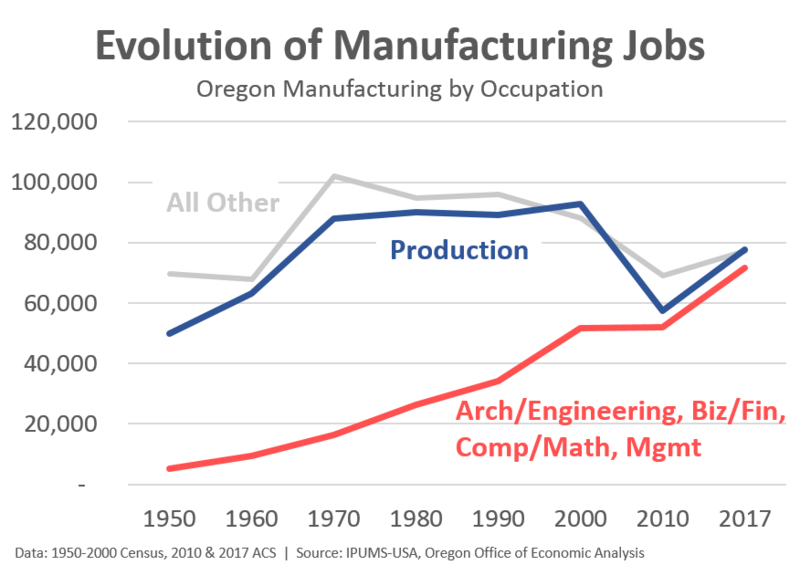 Overall there can be winners in stagnant industries (think Oregon’s tech manufacturing) just as there can be losers in industries on the rise (think of recent brewery closures). Third, the growth seen in Education and Health — so-called Eds and Meds — is tremendous. Employment has increased significantly faster than in other sectors and the recession hardly impacted the industries, or at least not to the downside. That said, there are some clear, fundamental reasons why and we will tackle this a little bit more tomorrow. Next, we take the same framework but instead of looking at industries, we apply it to the different metros and regions of the state. Here we see a few more outliers in terms of relative economic performance. In terms of regions that have grown slower, we see our southern and eastern rural counties along with those more closely tied to timber and manufacturing. 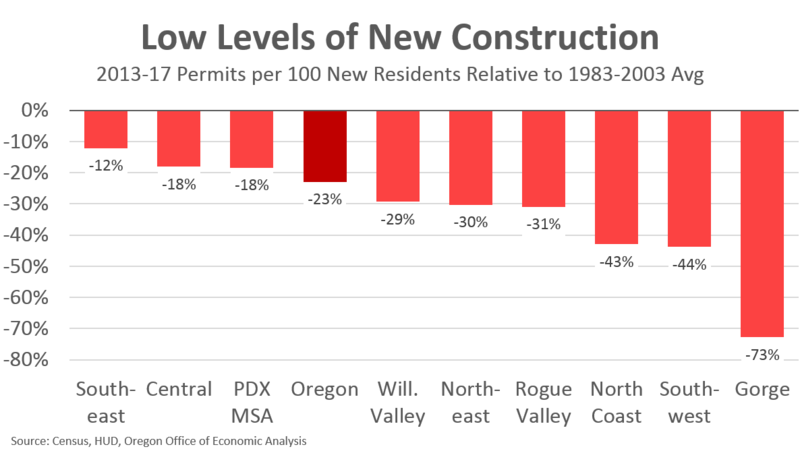 Among the fastest growing regions in recent decades we see the Gorge which largely skated by the Great Recession, and then the phoenix that is Bend always rising from the ashes. Tomorrow I will take a quick look at Eds and Meds. In a future post I will dive into industrial diversification at the regional level over the past 40 years. That’s a ton of data work that I am about halfway done with. But stay tuned for that next month. Probably. The best economic news in recent years is the growth seen in household incomes. They are rising as we have more Oregonians employed who are working more hours and for higher pay. Oregon’s growth has been considerably stronger than what is experienced in the typical state and our median household income now matches the U.S. This has not happened since the mills closed in the 1980s. Importantly for gaming, households are feeling confident today. Consumer sentiment is high as incomes rise and gas prices remain relatively low. This is translating into more discretionary spending across the board. In fact entertainment spending — spectator events, museums, going out to eat, etc — in recent years has increased significantly faster than income growth or other types of spending. This is not debt-financed, but represents a shift in the types of goods and services households are buying today. Oregon’s aggregate growth outstrips the nation because our underlying economic gains are stronger, and due to faster population growth. That said, while overall entertainment spending is increasing at a faster pace, it is not being spent quite as much on gaming in particular. Yes, gambling revenues are up, make no mistake. However other types of discretionary spending are rising faster. We can see this clearly in the Las Vegas chart below. Tourists are back to pre-Great Recession levels. Spending on Leisure and Hospitality is at historic highs. However gaming revenues are just now getting back to where they were more than a decade ago. There has been a shift in consumer patterns, even as gaming remains a normal good in most places. However, even in a relatively strong economy nationwide, some mature gaming markets are seeing tepid gains at best. This is in large part due to increased competition. 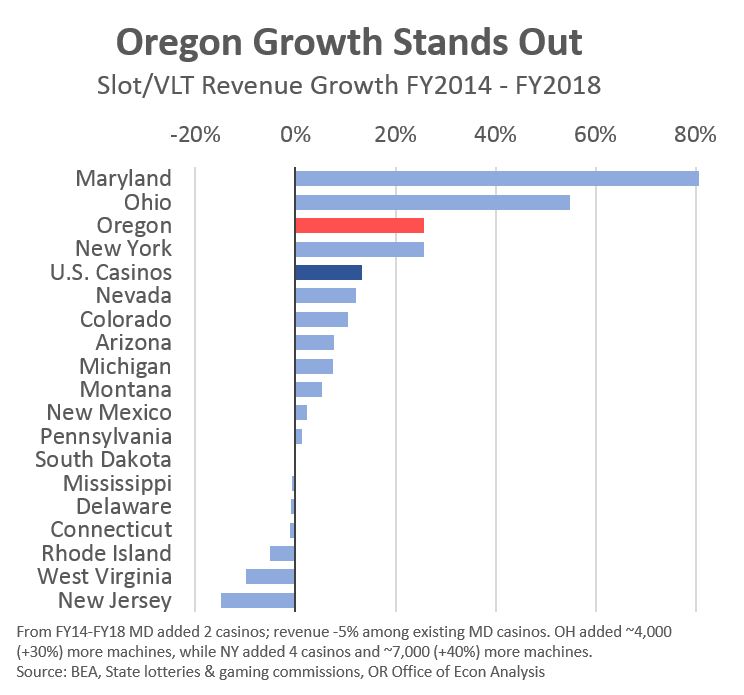 The states leading growth in recent years (MD, OH, NY) have all recently legalized gaming, added new casinos and significantly increased the number of slot machines. 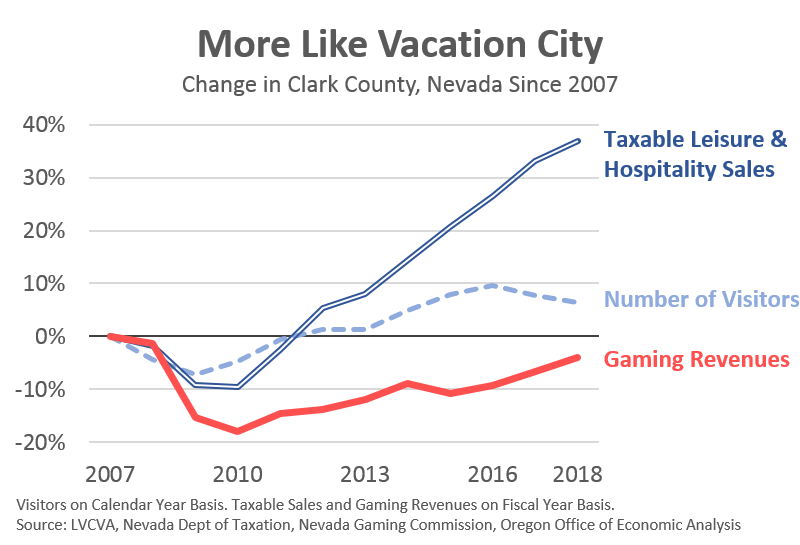 Much of these gains have come at the expense of their neighboring states, who legalized gaming years and decades ago. With this nationwide background, Oregon stands out. Growth in video lottery sales are twice that of the nation overall and other fast-growing, mature markets like Colorado and Nevada. This highlights the impact of Oregon’s video lottery terminal replacement program has had on sales. Over the past few years, Oregon Lottery has replaced all of the VLTs statewide and upgraded the underlying infrastructure and system. As the new VLTs were deployed statewide, sales increased as discussed before. 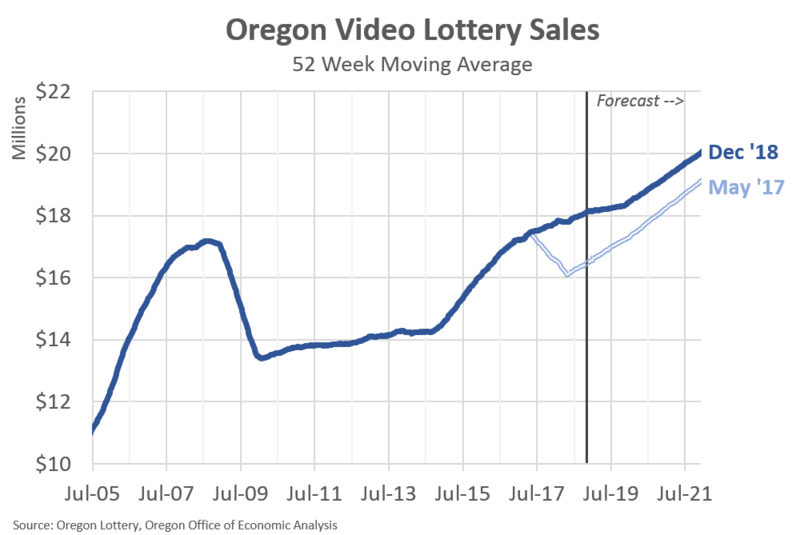 Roughly speaking, given national trends, half of Oregon’s video lottery sales growth is due to overall economic conditions and half due to the VLT replacements. Given the cannibalization due to increased competition seen throughout the country, the biggest issue facing the Lottery in recent years was the opening of the ilani Casino Resort in southwest Washington. Beginning with our 2016 forecasts, our office incorporated a large impact from the new casino in the outlook. However, a big impact has yet to materialize. The actual impact on sales is running about 15% of our initial projections from a few years ago. This impact is smaller and more geographically confined than initially expected. As such, our office’s forecast for this biennium has increased considerably — $162 million total, with $102 million coming from stronger video lottery, $43 million due to the billion dollar jackpots, and $17 million due to more administrative savings from Lottery. In somewhat comforting forecast news, our office was not alone in overestimating the impact on the local gaming market. That at least makes us feel a little bit better. Looking forward, at this point our office does not expect there to be further, significant impacts from the casino on our statewide forecast. Now, there may be ongoing issues, even a further erosion of sales at retailers along the border, but these are not likely to impact the topline forecast much. One main reason is that new casinos tend to ramp up for a year or two before stabilizing, or even seeing some declines. ilani will hit the two year mark here in a couple of months. One potential future change that would cause us to revisit these assumptions would be a hotel addition which would change the casino from a day trip into more of a destination. Our office and the Lottery research team continue to monitor these trends and discuss the outlook. All of that said, the underlying outlook for Lottery remains closely tied to the economy and income. That strong video lottery growth mentioned above (26%) perfectly matches the growth in Oregon personal income (26%) over the same time period. 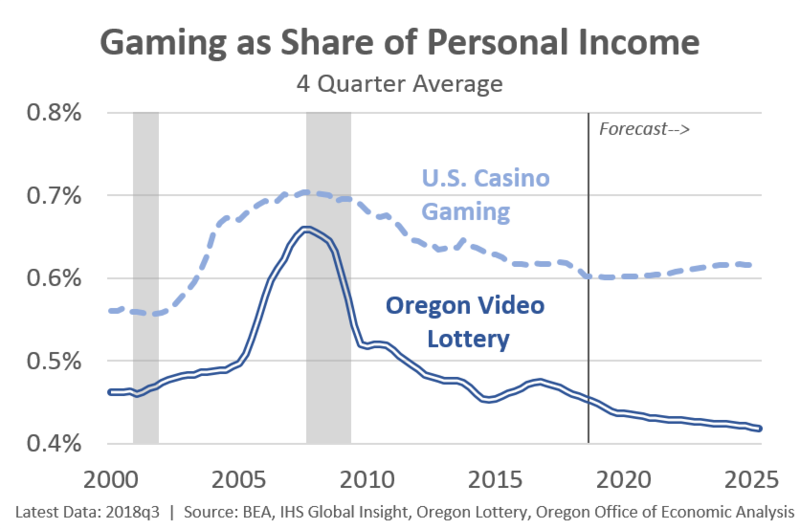 Lottery as a share of income in Oregon remains stable in recent years, and of course this is lower than the housing bubble highs hit just after the introduction of line games back in 2005. There are two main points to make in terms of the Lottery outlook. First, Lottery sales continue to increase. Oregon is and is expected to see increases in employment, wages, household incomes, and overall population in our office’s forecasts. As such, sales and available state resources (transfers) will increase in the future. These gains overall will be in the 3.5-4% range per year. Second, our underlying personal income forecast for Oregon is around 5% per year. This means that video lottery sales will grow but at a slightly slower pace than overall income in the state. This is due to three main risks to the outlook, excluding recessions and the business cycle in general. One is increased competition for entertainment spending. 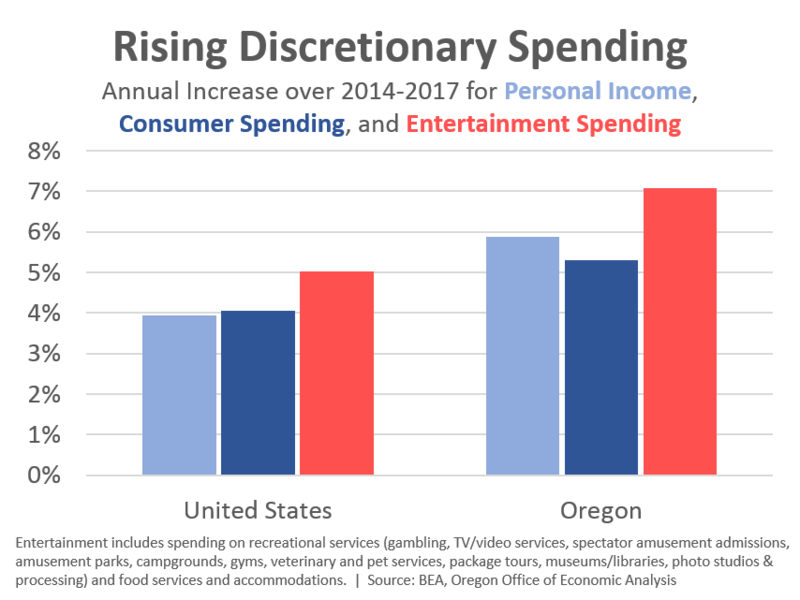 As discussed, discretionary spending is rising, but other entertainment options like going out to eat, or to the movies or sporting events are grabbing a somewhat larger share than gaming. Two is increased competition within the gaming industry, be it another private casino, online gaming (legal or illegal) or the like. As seen nationwide, gaming competition only increases. Three is the potential change in gaming preferences among younger generations. There is no question that Millennials and Gen Z (still a placeholder name) enjoy gaming. However it is much more Xbox and Playstation and less slot machines and card tables than their parents and grandparents. Bottom Line: Oregon Lottery sales continue to increase due to an improving economy and new game offerings. The outlook calls for ongoing growth and an increase in available resources for the state budget. However, the outlook is not without risks. Our office tends to view competition for household entertainment spending, other gaming options, and shifts in tastes and preferences to be more downside risks to the outlook. That said, to the extent these risks do not materialize or they have less of an impact — not unlike ilani — revenues will be higher than the baseline. As an economist, I’m fascinated and intrigued by start-ups and entrepreneurship. In part because they’re so vital to productivity and economic growth. In part because they’re at or near historic lows. And in part because we do not fully understand the motivations and drivers of these trends. I also tend to lump the self-employed and those working from home into this same general discussion. In my mind, from a big picture perspective, they all kinda, sorta do the same thing. They’re on their own. They’ve identified an opportunity to better serve customers and clients, or find a better work-life balance for themselves, and the like. However this is not entirely true. There is overlap among these groups, but it is not perfect. 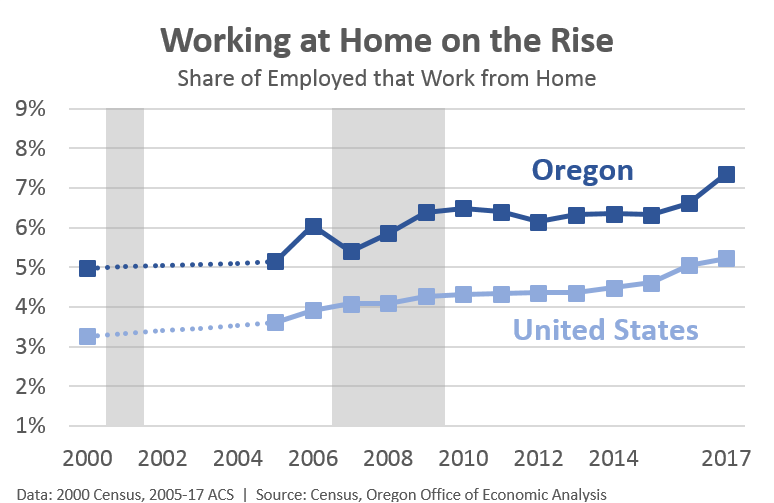 For instance, here in Oregon only about one-third of the self-employed work from home, while about half of those working from home are self-employed. There is a wider and more diverse swath of such workers than I thought when it comes to workplace arrangements. The rest of this post will specifically focus on those working from home. 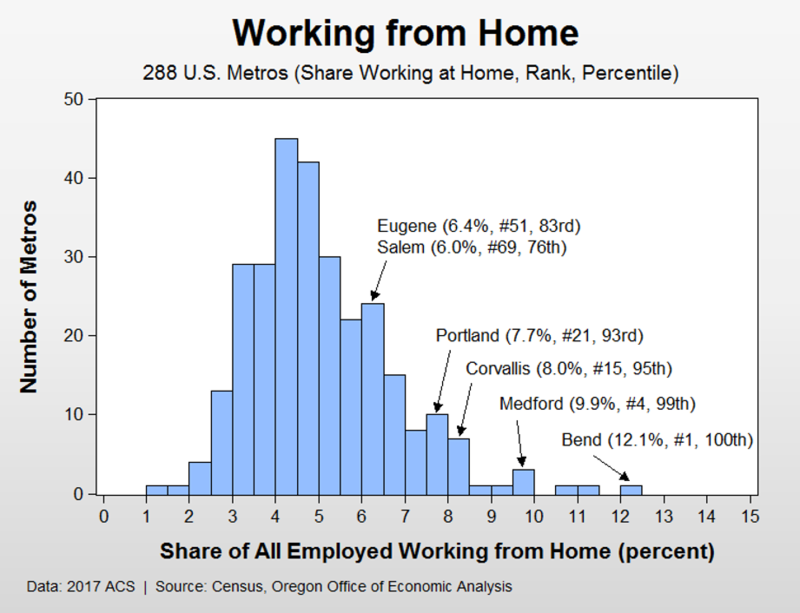 It turns out that significantly more Oregonians work from home than in the typical state. In fact, Oregon ranks #2 behind Colorado when looking across the country. Vermont, Utah, and Montana round out the Top 5, with our northern neighbor Washington ranking sixth. Furthermore, such work arrangements are rising somewhat over time, with much of the increase occurring in the past couple of years. 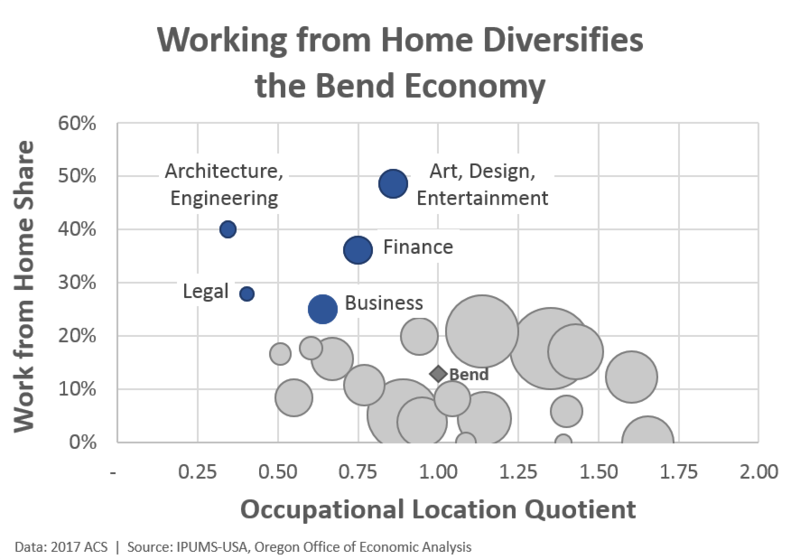 If we dig down and look across the nation’s metro areas, we find that Bend is the Work from Home Capitol of America. Bend ranks first among the 288 MSAs from which I pulled published Census data. Not far behind, Medford ranks #4 in the country. All of Oregon’s metro areas rank in the top quarter nationwide. (Both the published Census tables and the microdata missed some smaller metros, including Albany and Grants Pass.) The rest of the Top 10 include: Boulder, Lawton, Asheville, Fort Collins, Raleigh, Santa Cruz, Denver, and Austin. The questions then become, who are these workers, what do they do, and why do they work from home? We have some partial answers here that I find pretty interesting. First, those who work from home are about 6 years older than the workforce overall (median age is late 40s). Their earnings are also bimodal in that they have a larger share earning more than $75,000 per year, but also more with low or negative incomes (I assume due to business losses). Such workers are seen across all major occupational groups. Again, they represent a wide and diverse swath of the economy. Why these folks work from home is a bit more complicated. Using an updated Housing Trilemma dataset, I was able to look at the nation’s 100 largest metro areas and see which variables influenced the patterns of working from home. What I found in a basic model is that job growth, start-ups, and quality of life all are positively correlated with working from home and statistically significant. I also found that home prices were negatively correlated and statistically significant; that is, the higher home prices are, the lower the share of working from home. What I also found was that the cost of living in general, commute times, and software jobs were not statistically significant. 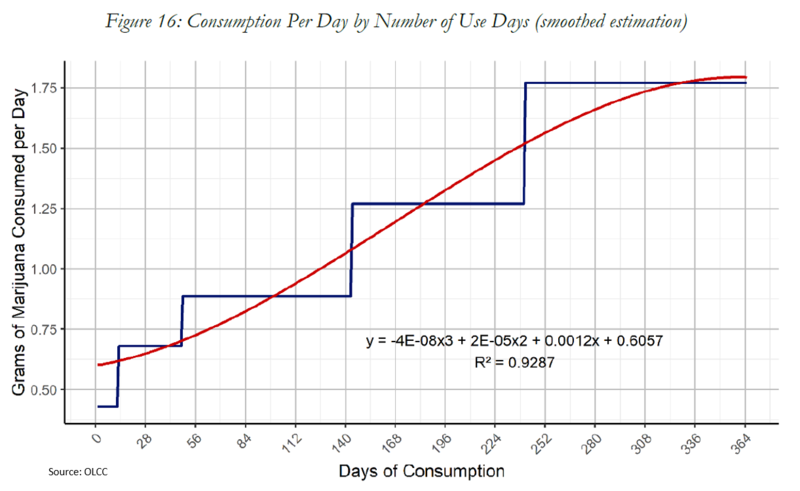 They were all correlated with working from home and had the expected sign, but offered no explanatory power in the model. 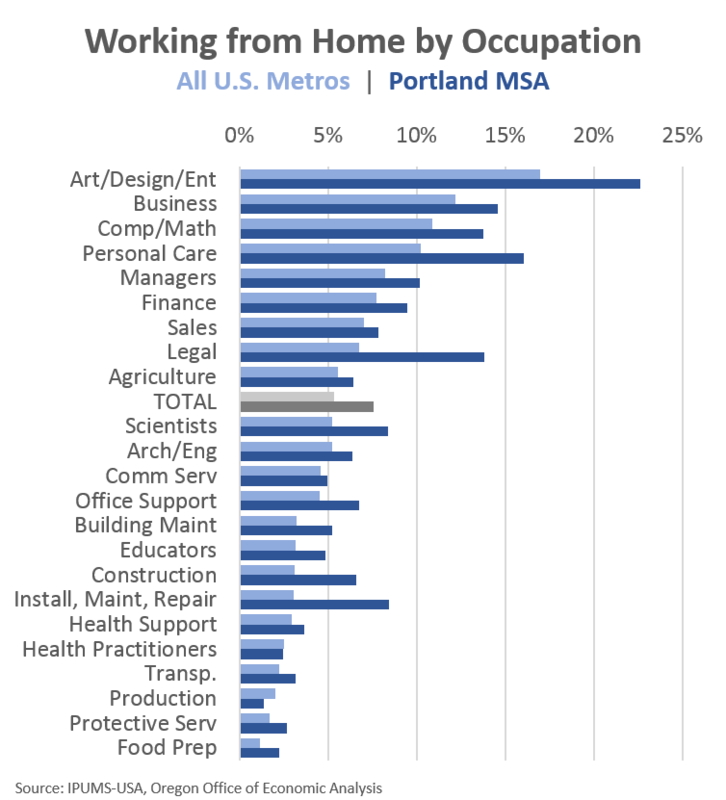 My takeaway is that economic vitality and quality of life drive the working from home patterns see among large metros, with housing costs offering an assist. Lastly, I want to highlight two key aspects seen in the data. One is that among high work from home regions of the country, these higher shares are seen across all occupational groups. And just like Portland leads the typical metro area — see chart below — Portland similarly trails across the board when stacked up against Austin and Denver. Note that Art/Design/Entertainment is driven by higher work from home concentrations among designers, writers, photographers, and artists. 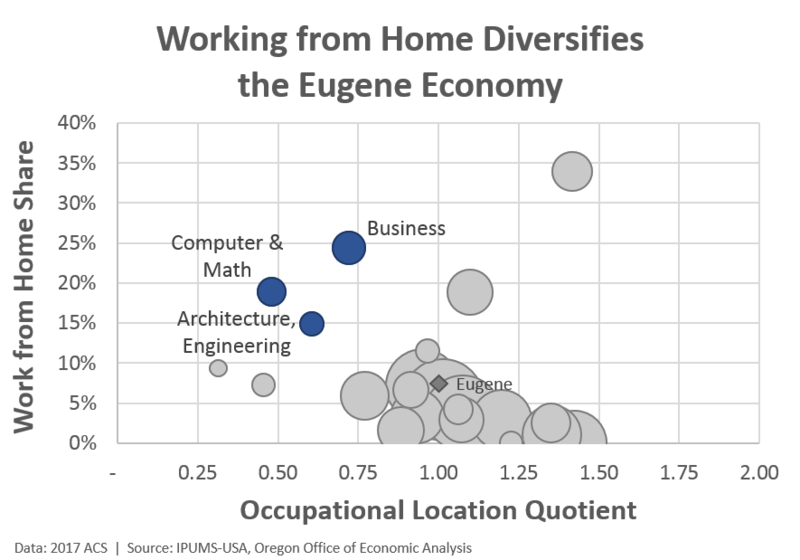 The second major item I found was that when looking at Bend, Eugene, and Medford specifically, these individuals who work from home are diversifying their regional economies. I feel like I’m burying the lede here because this is, in my mind, the most important finding from an economic perspective. 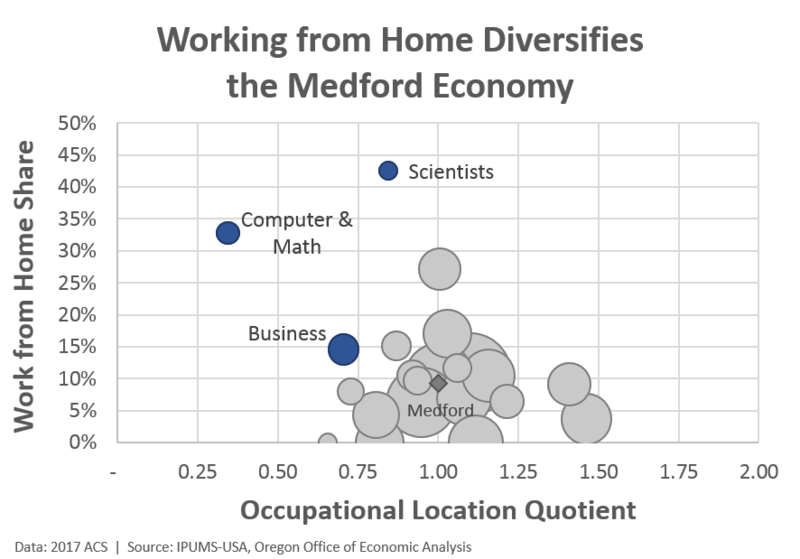 That is, the occupations that have high local concentrations in those working from home, are also underrepresented occupations when looking at the regional economy. In Bend we can see this among Architecture and Engineering, Business, Finance, Legal, and Arts, Design, and Entertainment occupations. These are individuals who most likely want to live in a place like Bend and either brought their job with them or set out on their own to make it work, which we have discussed before with Bend. These types of jobs are also more portable than janitors, teachers, chefs, and the like. They also tend to require a college degree. See here for a similar Eugene chart and here for a Medford version. Demographics are a powerful force. Next year the oldest Baby Boomers will turn 75 years old. In fact, over the next decade the fastest growing age cohorts in Oregon will all be 70 years old or older. 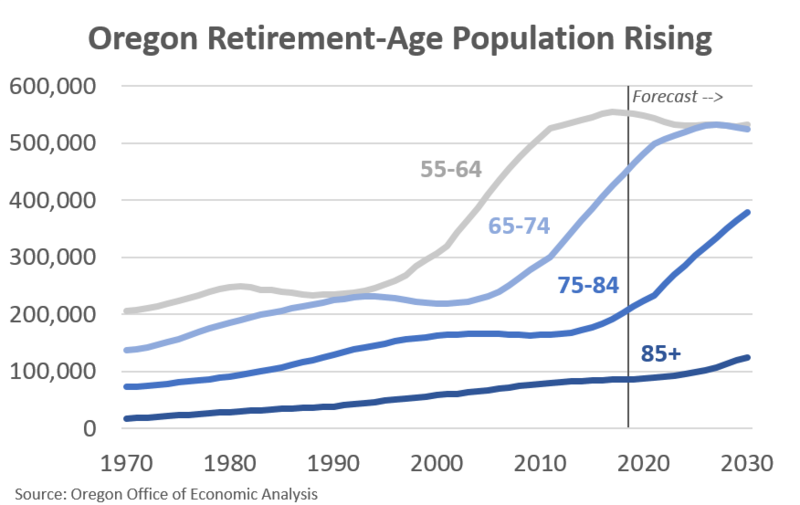 Now, even though Oregon sees a little bit of retiree migration, this growth is almost entirely about the aging population. The aging of the Silent Generation and the Baby Boomers is also having a tremendous impact on the regional and national economies. See Conor Sen’s recent article for more. It is weighing on growth rates of pretty much everything as they are exiting the workforce and shifting their incomes from wages to retirement accounts and Social Security. Over the years our office has covered much of this ground, however it’s been a few years since we’ve specifically discussed retirements and the outlook. A handful of years ago we expected 2016-2020 to be the peak of the retirement flows, that is the absolute number of retirements each year would be at their largest. Well, this hasn’t come to pass. In fact, over the past 3 years, actual retirements in Oregon have been only about half of what would have been expected based on demographics alone. Why? 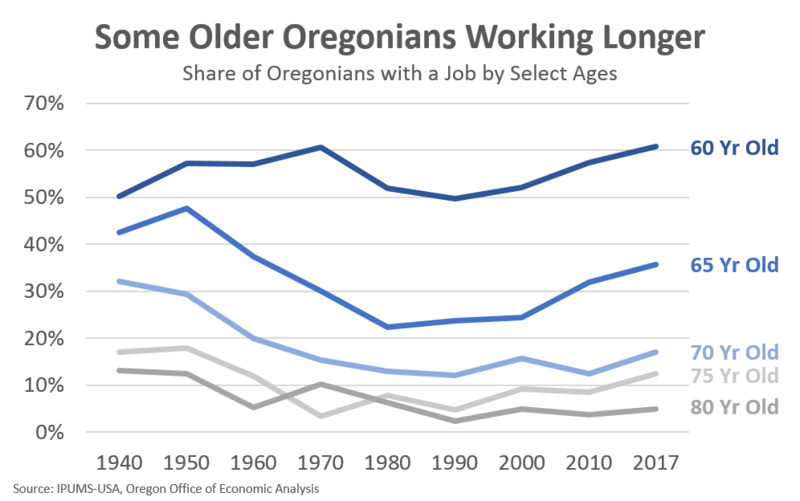 Older Oregonians are working to a larger degree. This goes for both relative to the past decade, but also when put in comparison to historical figures. 60 year old Oregonians are working at their highest rate today than at any point in recorded history (data back to 1900, not shown here). 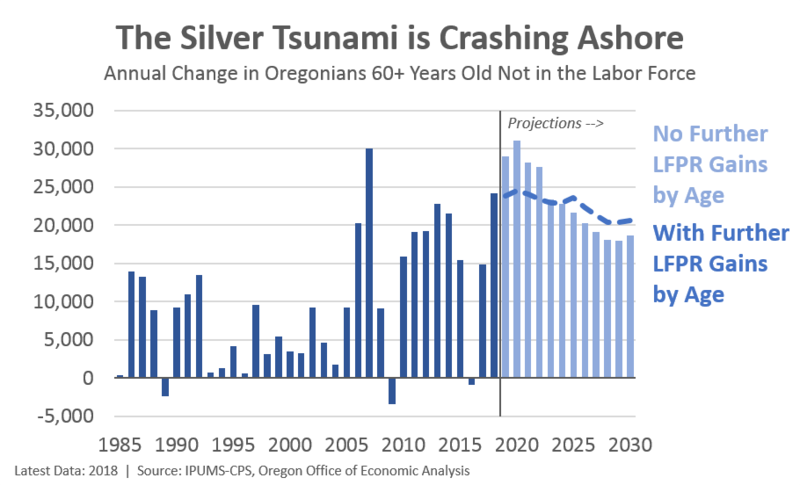 Additionally, Oregonians in their mid-60s through early-70s are working at higher rates than anything we’ve seen since the Great Society and War on Poverty began. There was a big decline in employment among older cohorts after the introduction of cost-of-living adjustments for Social Security in the 1950s, Medicare in the 1960s, and increases in old-age survivor benefits, SSI and the like. But these trends have reversed some in the past 20 years. Some, like the increased social security retirement age, lower savings and private pensions moving to defined contribution, mean older Americans are more exposed to macroeconomic fluctuations than previous generations and as a result need to work later in life. Others, like higher levels of educational attainment, improved health and less physically demanding jobs, allow individuals to work later in life if they choose to. While such changes impact individuals and their want or need to work, employers also face challenges and opportunities with older workers too. Note that the increase in employment among 65 year olds may be in large part due to the increase in Social Security’s full retirement age from 65 to 67. This change was made in 1983, and age 67 fully impacts those born in 1959 or later. That said, we have seen similar, proportionate increases at age 67, and at 69 so it is unlikely Social Security is the only factor here. Now, while older Oregonians may be working later in late for good and/or bad reasons, it has certainty been beneficial for local businesses. Companies are able to retain these workers with a lifetime of experience and institutional knowledge for their industries and firms. Such workers cannot instantaneously be replaced. It creates challenges for businesses to adjust and adapt when such workers exit the workforce. So keeping them in the labor force awhile longer is beneficial overall, particularly in a tight labor market like we have now. All of that said, we know Father Time is undefeated. Given the underlying demographics, retirements are expected to remain at high levels throughout the coming decade. If we only look at the age distribution of the population, retirements are expected to be largest during the next few years. However, given we have seen employment rates and labor force participation rates (LFPR) rise in recent decades, some continuation of these trends is likely warranted given the discussion above. Even under this scenario where firms are able to retain their workers for a few more years, retirements will more or less hold steady at these historically high levels for the coming decade. Bottom Line: Retirements will remain at high levels for the coming decade. The demographic crunch is here to stay for the foreseeable future. This puts pressure on the labor market in terms of businesses looking to hire and expand. It also opens up opportunities for younger workers to step into leadership positions. The generational churn in the labor market will mask job opportunities as net growth rates will be lower than in the past. For every retiring worker, a firm has to hire 2 workers to see positive job growth. The first worker simply replaces the retiree, representing no net growth. In the coming years, our office’s baseline employment outlook calls for <1% annual gains, with jobs increasing by 10-20,000 per year. Given retirements, the actual number of job openings for Millennials, Post-Millennials, Gen Z, or whatever we end up calling today’s youth, will be at 2-3 times as large. There will be enough jobs. 2018 was another banner year for the economy. Jobs in Oregon are on pace to increase 2.1% which is good growth for the ninth year of an economic expansion. 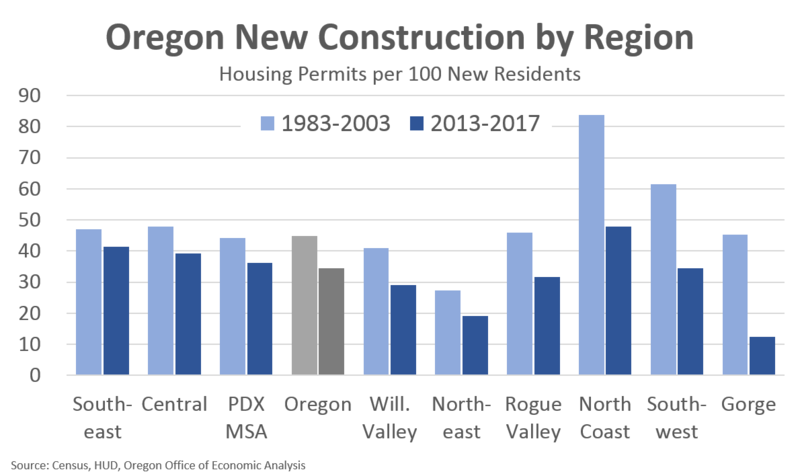 More importantly these gains are still strong enough to accommodate the influx of new residents and the Oregonians entering or coming back into the labor market. The unemployment rate is on pace for another historic low at 4.0% even as the population grows and participation rates by age cohorts are higher than a few years ago. While topline indicators look great, improvements continue to be seen underneath the surface as well. In the past couple of years, economic growth is translating into better economic outcomes, including rising incomes, across Oregon’s industries, regions, and racial and ethnic groups. As such, two of the biggest under the radar outcomes this past year are rural areas regaining their employment levels from a decade ago, and the poverty rate for Oregon’s communities of color reaching a likely historic low. 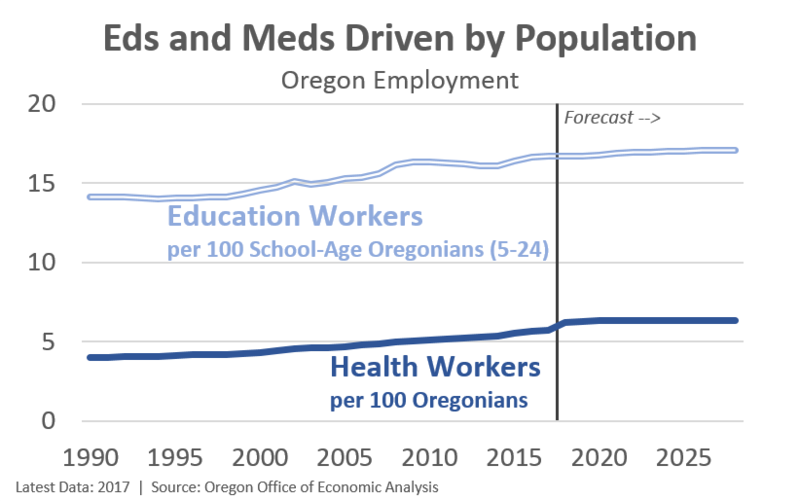 First, let’s look at employment in rural Oregon. Both urban and rural areas of the state, in aggregate, lost the same percentage of their jobs during the Great Recession. 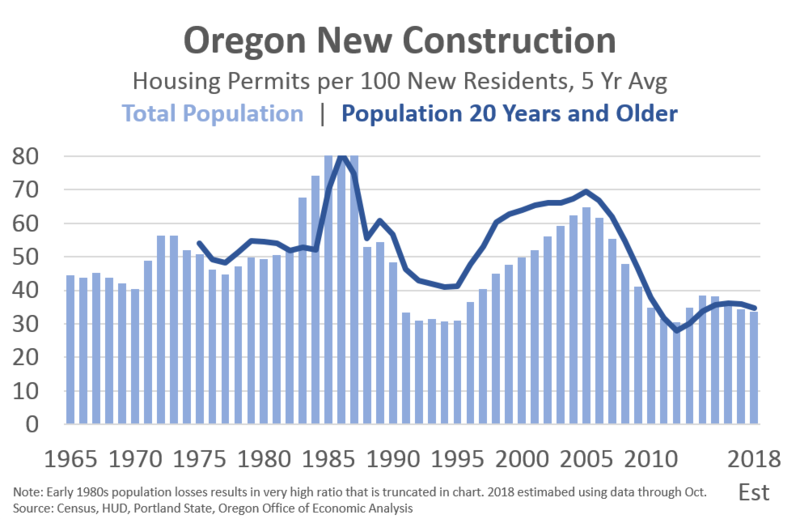 However, urban areas returned to growth first — Portland in particular, being the biggest and most diverse economy in the state — and have been at historic highs for years. Rural areas, on the other hand, spent nearly 4 years at the bottom of the Great Recession with meaningful job growth only returning in 2014 or so. 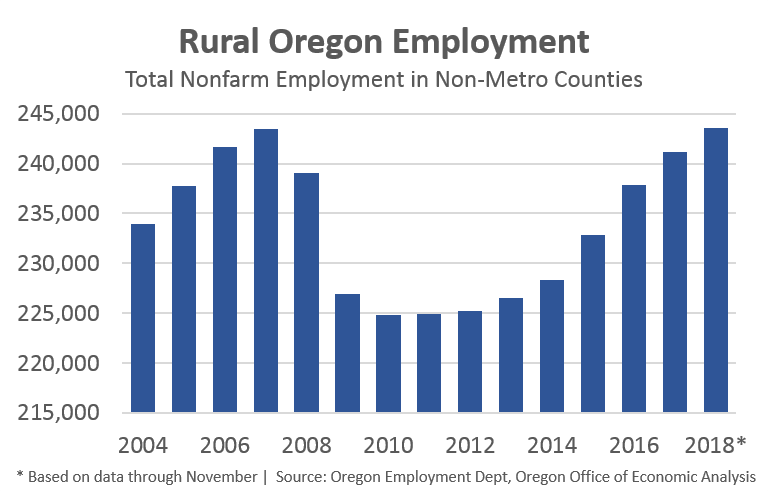 Fast forward to today, employment in Oregon’s rural counties is now back to where it was prior to the Great Recession. This is not a destination, but is an important milestone to note. Of course there is a lot of variation across rural Oregon. Every county and regional economy is different. Places like the North Cost, Gorge, and Northeastern Oregon have all done and continue to do well. Our southern regions have seen less robust gains. That said, the median rural county is 80% recovered in terms of jobs today relative to pre-Great Recession peaks. Only a few have seen hardly any growth this expansion, namely Crook, Gilliam, Grant, and Harney. Looking forward, Oregon’s rural economies will continue to grow and improve. The vast majority of the demographic drag is in the rearview mirror. 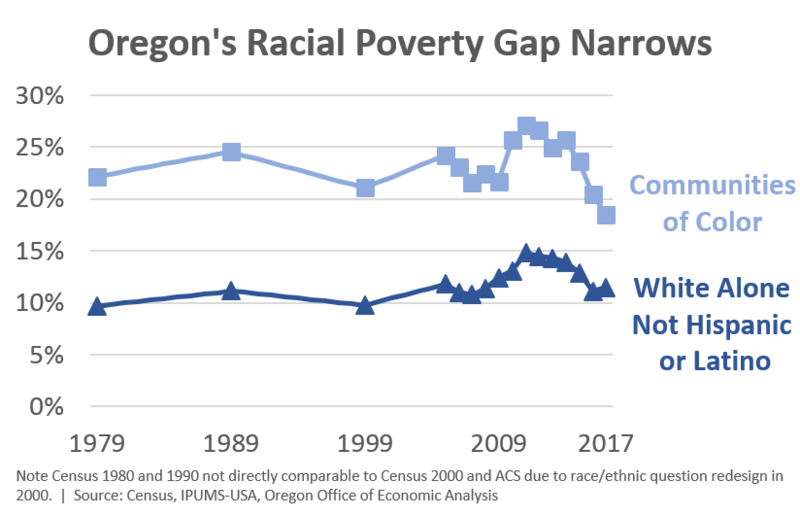 The second major under the radar milestone reached this past year is a likely historically low poverty rate for Oregon’s communities of color. I say likely because Census redesigned the race question in 2000. Before then a person could only choose one race, where as beginning with Census 2000, a person could choose multiple races. As such historical figures are not perfectly comparable to current figures. I also only went back to Census 1980 to crunch the numbers. That said, we know from earlier work that the economic recovery is reaching all groups in Oregon even as big racial gaps remain. And even though this refers to 2017 data, it was released in 2018. 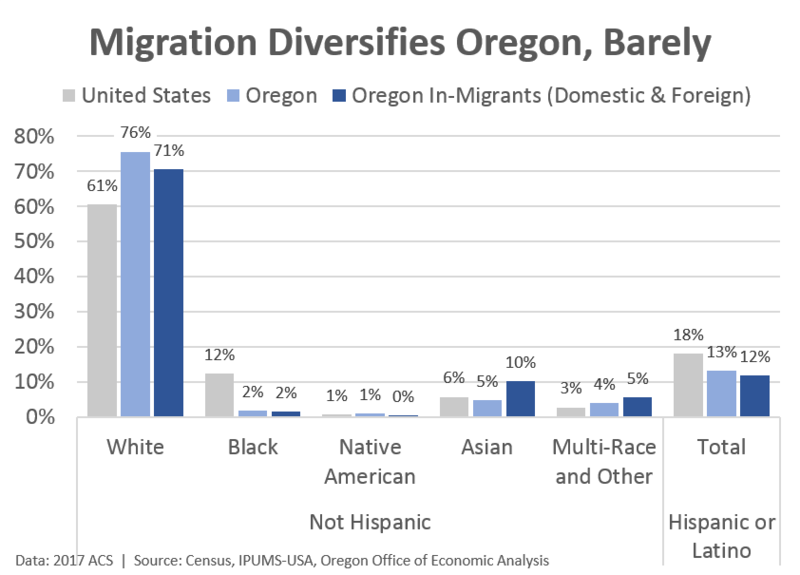 Now, just as there is not one uniform rural Oregon, there is considerable variation among the various racial and ethnic groups in the state as well. Relative to recent history, American Indian and Alaska Natives in Oregon currently have a record low poverty rate, as do Hispanics. Black Oregonians are near historic lows, but they current experience poverty rates about one percentage point higher then seen in 1999 or just as the economy crashed a decade ago. Poverty rates seen among Asian or Pacific Islander Oregonians are somewhat higher than a decade ago. As discussed before, big disparities remain in the economy. This includes industry trends, geographic differences, outcomes by race or ethnicity, or outcomes by educational attainment, and the like. However, as the expansion continues, these disparities are expected to narrow. A tight labor market does wonders, even if it does not cure all ills. 2018 was another example of this and expectations are 2019 will be another good year for the economy.